High performance, intrinsically safe, Class 1, Division 1 Stinger flashlight. Developed for hazardous locations, atmospheres and environments including petro-chem, utility and other heavy industrial applications. Streamlight rechargeable LED flashlights make good economic environmental sense. Over time they cost significantly less tooperate decreasing the amount of batteries used, relieving the problem of battery disposal. 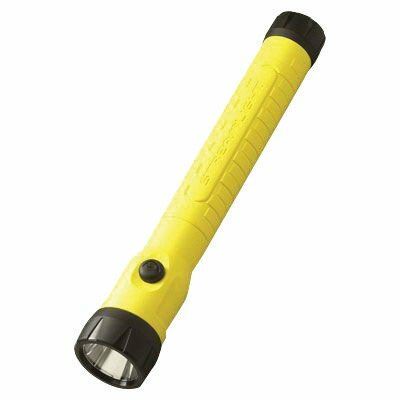 With Streamlight LED rechargeable flashlights, your company will not only save on the cost of batteries. Since LEDs have a long life and won't burn out or won't break,they never need to be replaced. Your light will always be ready when you need it. More powerful and more economical, Streamlight rechargeable LED lighting tools packa lot more power with ultra-bright white beams and long illumination times. "Division" refers to the likelihood that ignitable concentrations of flammable materials are present in a given area. Division 1 designates an environment where ignitable concentrations of flammable gases, liquids, vapors or dusts can exist some of the time or all of the time under normal operating conditions or where easily ignitable fibers and flyings are manufactured, handled or used.